Representatives of the city and Forest City Ratner objected strenuously yesterday to the New York City Independent Budget Office (IBO) report concluding that the Atlantic Yards arena would be a loss for the city. Perhaps soon they'll confront another report--discussed further below--that concludes that projections by the state and Forest City Ratner that the project would take ten years are way overoptimistic--and that the developer assumed rental and condo rates well over the current market. That suggests delays in the project and thus delays in the promised benefits about which government officials and FCR seem so certain. The main objection is that the IBO counted the direct subsidies against the arena only, concluding that the other subsidies and tax breaks were as-of-right. That's a legitimate question for debate, but it's worth a closer look. All $100 million of the city's initial subsidy went to buy land on the arena block for example. Can city, FCR be trusted? 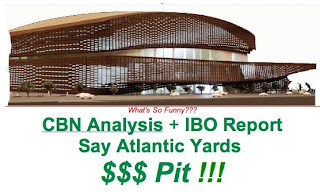 Keep in mind that, in 2005, Forest City Ratner had no problem with the IBO's methodology, praising it for concluding that the arena was a "win-win" situation for the city and the state. And the citations about benefits from the larger project would be more convincing if the city, state, and Forest City Ratner had produced reports more credible than that of the IBO. The New York City Economic Development Corporation (NYC EDC), for example, produced a report that considered only benefits, not costs--in other words, an inversion of Bloomberg's formulation. NYC EDC spokesman David Lombino claimed that Atlantic Yards was "a site that is now an open railyard without any public benefit," though he surely knows the railyard is less than 30% of the site and it's a working railyard. And Forest City Ratner commissioned and promoted the $6 billion lie. All the promised benefits, in fact, are premised on a ten-year buildout of the project. But the Council of Brooklyn Neighborhoods (CBN) yesterday released a sober assessment, by an independent real estate analyst, which concluded that "the project cannot be completed anywhere near 2019" and likely would take at least 20 years. That's not exactly a radical conclusion. The then-CEO of the Empire State Development Corporation, Marisa Lago, admitted in April that the project would take "decades." Executives from parent Forest City Enterprises (FCE) have similarly acknowledged they're bad at estimating how long a project might take. And Forest City Ratner's AY point person, Maryanne Gilmartin, acknowledged in July, "Nobody has a crystal ball about the real estate market." CBN submitted the report, “A Decades Long Project: Atlantic Yards Financial Feasibility Study,” as part of its comments to the Empire State Development Corporation (ESDC) on the 2009 Modified General Project Plan. Presumably consultants AKRF will respond to the comments in a technical memorandum presented to ESDC board members before they vote to approve the project at their meeting September 17. The report was commissioned from Kahr Real Estate Group, a firm that works with commercial and investment banks, private real estate investment firms, REITs, developers, and government organizations throughout the world. Principal Joshua Kahr writes frequently for Urban Land, the monthly magazine of the Urban Land Institute, an organization that includes major developers, including FCE. In other words, he's hardly a flaming radical; nor would it be prudent of him to do work that would damage his credibility. Kahr concludes that Forest City Ratner's plan--at least as presented officially by the state--"calls for development to continue unabated for almost 10 years irrespective of the state of the overall economy. In reality, buildings will not be developed if demand is lacking." The current state of the capital markets will make it extremely difficult to obtain financing for a project of this size within the next 36 months. The projected residential market rate rental and condominium prices that the developer relied on when they originally underwrote the deal are substantially above the current market. They created their projection in 2006, a time that in retrospect is considered to be the top of the last real estate cycle. The demand for housing units is most likely not sufficient to support a project of this scale over the next ten years. The developer recently restructured its original agreement with the MTA to enable it to exit the purchase of the Phase II properties for a minimal or no breakup fee depending on timing. Based on the timing of the payments, we believe that this indicates that the developer is concerned about its ability to complete the project within the stated 10 year time frame. Kahr points out that, according to a 2006 KPMG report relied on by the ESDC, Forest City Ratner expects to rent market-rate rentals--2250 of the 4500 planned--at $45 a square foot, but the average rental rate is currently $35.50 for such units. 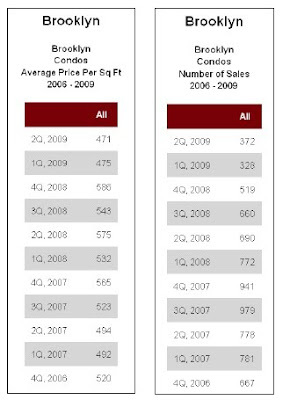 Kahr also suggests that the projected $850/sf price for condos was also way overoptimistic. Given recent price drops in Manhattan, "the Brooklyn properties should be in the $600 PSF range," he writes. Kahr acknowledges that New York is big enough to absorb a development with 6430 housing units. However, he writes, "The larger issue is that the development timeline assumes almost continuous development, and of course, continuous development assumes a continuously healthy economic environment." He notes that, while the Blight Study conducted by AKRF was supposed to contain a market analysis, it was either never completed or never made public. Kahr notes that, while the citywide vacancy rate was 2.88% in 2008, for high-end units, it was 7.2%. 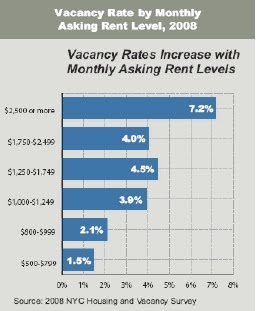 The KPMG study projected that the market's vacancy among units over $2500 would range from 2.9% to 4.9%. Couple that with a glut of projects that have never been completed around Downtown Brooklyn, he writes, and there are further reasons for doubt about the projections. Kahr takes aim at a statement in the ESDC's recent Technical Memorandum that competition from other projects would be minimal because the overall market would affect all projects similarly. "The problem with this statement is that it's just not true," he writes. "A mixed-use development of this scale cannot be simply compared with a developer that is building a much smaller 100-unit residential building... Financing for any construction project in today's market is extremely difficult to obtain; for a project with any level of complexity to it, such as a large scale mixed-use multi-phase development, it will be almost impossible. To put it simply in today's market, banks can choose to put their limited capital to work on only the safest, easiest to understand projects and the Atlantic Yards project is neither." Projects like Battery Park City and Forest City Ratner's MetroTech, he notes, have taken much longer than initially projected. Kahr suggests that the projected internal rate of return (IRR) of the mixed-use component of the development was 9.86% in 2006. A delay in the project could be significant. "Unfortunately, without access to FCRC's financial model, it is impossible to fully replicate what a delay in the timing of the project would result in," he writes. "Nonetheless, the key point is that even a minor delay in the project's timing will make it very difficult to complete." Kahr also questions the projected $39/sf Forest City assumed it could get for office space. "Across all office classes, rent is expected to decrease about 4.4$ in 2009 to $27.60 per square foot, with class A space at 433.56 per square foot," he writes. "Premiums of 10% to 15% [for Atlantic Yards] may be achievable, but assuming more than that may be aggressive and prove challenging." While the Modified General Project Plan (MGPP) reports that buildings are expected to be constructed in a tight schedule, he writes, "The problem with this plan is that it envisions a stunning level of new ground-up residential and/or office development to start essentially in 2010 or 2011. Also, Kahr thinks the ESDC did not come clean in the MGPP: "We find it telling that the ESDC did not show how the project would be potentially financed; in today's unusually erratic credit markets, this is probably the most important issue for any developer." Kahr also questions the plans for affordable housing. "The larger issue for the affordable housing portion of the project is whether or not there is sufficient bonding capacity to enable its successful development," he writes. "The development of 2,250 affordable housing units is substantial. While a full analysis of the State's capacity to issue bonds is beyond the scope of this report, it's not clear whether or not the City and State has sufficient capacity in the near and long-term future to finance their share of this project. Furthermore, if the City and State do not issue a sufficient amount of bonds to subsidize the development, it is unclear whether or not FCRC must still build the affordable housing. If they were to be required, the weight of building 2,250 housing units and renting them for substantially below market could easily sink any development." interesting that there's nothing in the times about these reports. Actually, the Times reported Thursday morning in print on the CBN report. The Times reported online regarding the IBO report and excerpted that report in print today. oops, i spoke too soon. it sure wasn't front and center in the online version.